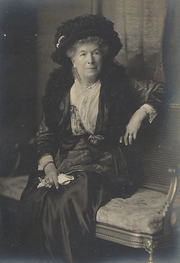 Mary Augusta Ward, née Arnold, was born in Hobart, Tasmania, Australia, to a prominent British intellectual and literary family. Her father Tom Arnold was a literary scholar and professor of literature, her paternal uncle was poet Matthew Arnold, and her paternal grandfather was Thomas Arnold, headmaster of Rugby School. Julian and Aldous Huxley were her nephews. In 1856, her father moved the family to Ireland and she was sent to various boarding schools for her education. At 16, she went to live with her parents at Oxford, where her father had become a lecturer in history at the university. In 1872, she married Humphry Ward, a fellow of Brasenose College, Oxford, and a writer. In 1877, she wrote a large number of entries for the Dictionary of Christian Biography. She began contributing articles to Macmillan's Magazine and the Pall Mall Gazette while writing a children's book, Milly and Olly, or a Holiday Among the Mountains, published in 1881. Her works were published under her married name Mrs. Humphry Ward. Her controversial and successful novel for adults Robert Elsmere (1888) was followed by more than 20 other novels, and by the end of the 19th-century, she had become a famous bestselling author. She also worked for social reform and helped establish adult educational colleges first at Marchmont Hall and later at Tavistock Place in Bloomsbury, now known as the Mary Ward Centre. She opposed the women's suffrage movement but favored women's participation in local government. During World War I, she visited the front in France and reported on it in three books, including England's Effort—Six Letters to an American Friend (1916) and Towards the Goal (1917), with a foreword by former President Theodore Roosevelt. She published her autobiography, A Writer’s Recollections, in 1918. Mrs. Humphry Ward is currently considered a "single author." If one or more works are by a distinct, homonymous authors, go ahead and split the author. Mrs. Humphry Ward is composed of 16 names. You can examine and separate out names.